Imagine a night in a maharaja’s palace. The scent of incense gives the room an atmosphere as exotic as its surroundings. A small fountain gently splashes in the sitting room. 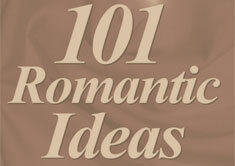 In the bedroom, antique carved furniture sets the mood for a romantic evening. 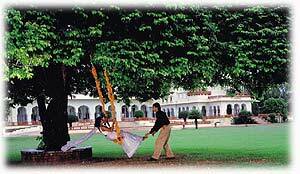 This is Rambagh Palace where, like other lucky travelers, we learned that you no longer have to be a maharani to enjoy a night in a maharaja’s suite. Today this expansive palace, located outside the city of Jaipur, is a grand hotel welcoming guests from around the world. Located in the state of Rajasthan, Rambagh is filled with the rich history of the Rajputs. First a home for the queen’s favorite maid, the building later became a hunting lodge and guest house, soon renamed for Maharaja Sawai Ram Singh II. As a young prince, his grandson later came here during its days as a private school and in 1925 Maharaja Sawai Man Singh II made Rambagh a palace in the grandest sense of the word. Our arrival at Rambagh was heralded, literally, by trumpeting elephants and regal camels. Groups can arrange for these special welcomes truly fit for a king. Riding high atop a caparisoned elephant decorated with flowery designs, we rode to the palace like a maharaja and maharani. Dismounting, a woman in a richly colorful sari met us and placed a tikka, the auspicious red dot, on each of our foreheads. We were draped in marigold garlands while, at our feet, a marigold pattern welcomed us. 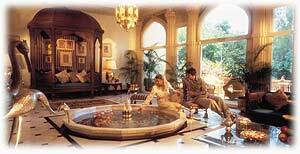 While Rambagh may today be a hotel rather than a palace, it is certainly still royal. Located on 47 acres, the sprawling edifice stands like a cool beige mirage, surrounded by five gardens. Colorful peacocks strut across the manicured lawns, small birds take shelter in the mandarin orange bushes, and small monkeys skitter across the lawn, eager to grab a piece of succulent fruit. Today many of the royal rooms function as guest rooms, thanks to the palace’s conversion to a luxury hotel. Among the most lavish rooms are the Prince’s Suite, complete with a fountain, the Maharani Suite, a romantic dream in rich red brocades and a canopied seating area; and the Maharaja Suites, two adjoining rooms in a simpler style and showcasing, appropriately enough, a king-sized canopied bed. One of the most unique suites is the Sheesh Mahal, highlighted by thousands of cut glass pieces around the ceiling and on the walls, each glistening with reflections from the cut glass chandelier. With accommodations fit for a king, it’s no surprise that through the years Rambagh has seen many famous faces among its guests including Jacqueline Kennedy, Lord and Lady Mountbatten, and Queen Elizabeth and Prince Philip. For today’s guests, a visit to Rambagh isn’t royal duty but a royal pleasure, a chance to step back in time and, for a brief period, enjoy the elegance of palace living.